TOTAL QUANTITY:68 LONG SLEEVE SILVER CROPPED JACKET WITH LARGE SILVER SEQUINS AND SILVER LINING AND BLACK HAREM PANTS. MADE BY STARS DANCEWEAR. LARGE TEAM SET. YOUTH AND PLUS SIZES AVAILABLE. THIS SET IS CHOSEN BY THE JACKET SIZE, THE REST OF THE PIECES WILL BE MATCHED AS CLOSELY AS POSSIBLE. BLUE RACER BACK TOP ONLY 49 QUANTITY. TOTAL QUANTITY: 21 AVAILABLE SIZES: 6 SMALL 14 MEDIUM 3 LARGE GORGEOUS SHOWGIRL SET FEATURES A WHITE SPARKLE VELOUR LEOTARD WITH TAN SPARKLE MESH AROUND THE NECKLINE AND CONTINUES TO THE KEYHOLE BACK. THERE IS A CLASP CLOSURE. 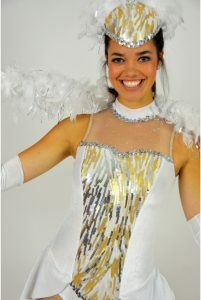 SPARKLE WHITE VELOUR AND SILVER SEQUINS ACCENT THE NECKLINE. ON THE FRONT OF THE LEOTARD DOWN TO THE ATTACHED SKIRT IS A PANEL OF MUTED GOLD, SILVER AND WHITE SEQUINS ON WHITE DOUBLE LAYERED MESH. THE ATTACHED SKIRT IS COMPOSE OF WHITE VELOUR AND TULLE LAYERS WITH A 15" DROP. BY CICCI. THE MODEL IS WEARING A SIZE MEDIUM.